Tunis, Tunisia – Almost seven years after the uprising that toppled one of the Arab world’s longest serving autocrats, a looming political stalemate is threatening the stability Tunisia desperately needs to revive its stagnant economy. Late last month, the general-secretary of Tunisia’s ruling party Nidaa Tounes, Slim Riahi, initiated legal proceedings in a Tunis military tribunal against current Prime Minister Youssef Chahed and a number of other officials, accusing them of plotting to stage a coup against President Beji Caid Essebsi. Riahi’s move came in response to a recent partial cabinet reshuffle led by Chahed – himself a member of Nidaa Tounes – that created a high-level standoff between the prime minister and the party. The ruling party had called on its members in parliament to boycott the reshuffle. Instead, a number of them resigned from the party and voted in favour of it. Nidaa Tounes, Arabic for the “Call of Tunisia”, has seen almost half of its 86 MPs defect since 2014, several of them joining rival factions, feeding speculation that the collapse of the ruling party is imminent. But Nidaa Tounes has been breaking apart in ways that analysts have been predicting for the past six years. Nidaa Tounes’ state of “fragmentation” today was “expected, and will only continue,” Jomai Gasmi, a Tunisian political analyst, told Al Jazeera. Founded in 2012 by President Essebsi, Nidaa Tounes is a self-styled big tent “secularist” party that patched together diverse actors, including wealthy businessmen, progressive liberals, secular leftists, trade unionists, and even former regime members. The varying party members shared no coherent political ideology or vision for the country’s ailing economy. Instead, what bound them together was the common objective of curbing the dominance of the then-ruling party, Ennahda, over the political and public spheres, explained Gasmi. The conservative Ennahda party ruled in a tripartite coalition government with two secular parties, dubbed the “Troika,” roughly from 2011 to 2014. In this transitional period, Tunisia was rocked by the assassination of two opposition leaders and saw hundreds of youth joining armed groups, while the country continued to struggle with the same economic issues that catalysed the 2011 revolution. Caricaturing Ennahda as uncultured and retrogressive, Nidaa Tounes held it single-handedly responsible for the country’s woes. Nidaa Tounes would go on to win a plurality in the October 2014 legislative elections, securing 86 out of a total 217 parliamentary seats. Ennahda came in second with 69 seats. A month later, Nidaa’s founder, Essebsi, would win the presidency. The legislative and presidential elections marked the end of Tunisia’s transition period. Branding itself as the “national modernist and democratic” alternative, Nidaa Tounes secured a “strategic vote” against Ennahda, said Gasmi. Structural and ideological unity is the defining factor a political party’s sustainability relies upon, something Nidaa Tounes lacked from the beginning, he explained. It didn’t take long for the cracks within Tunisia’s new ruling party to begin to emerge. Its founder, now president of the republic, Essebsi could no longer continue as the head of the party. That is when “the first disagreements within the party began… triggering the conflict over his [Essebsi] legacy,” said Julius Dihstelhoff, a research fellow at the Center for Near and Middle Eastern Studies. Today’s crisis is a “mirror of this struggle for Essebsi’s succession,” Dihstelhoff added. 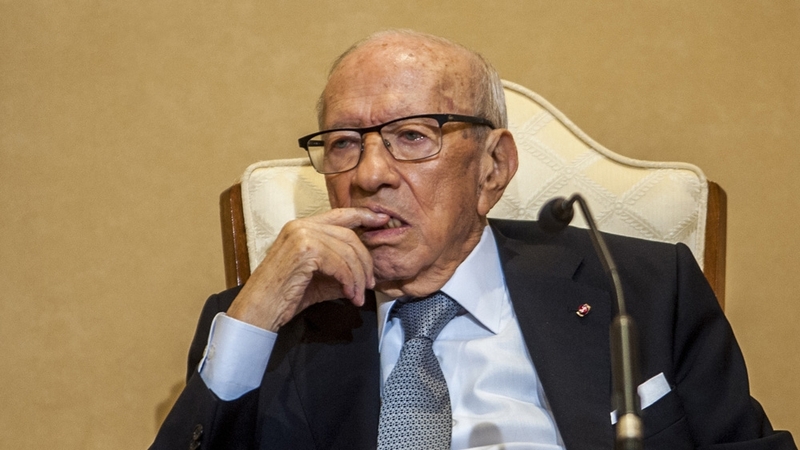 Once a close advisor of Tunisia’s founding father, Habib Bourguiba, and a veteran of the country’s struggle for independence, Essebsi was seen by supporters and party members alike as the “old wolf” statesman capable of modernising the country and bridging its political divide. Left to its own devices, Nidaa Tounes witnessed a leadership crisis that pitted the president’s son and party heir, Hafedh, and his supporters, against those who opposed a perceived attempt of hereditary transfer of power and return to autocratic rule. The internal dispute over leadership split Nidaa Tounes into two opposing camps – their approaches were so irreconcilable that violent brawls began to break out in party meetings. By 2015, dozens of party members had resigned, including leading figure Mohsen Marzouk, who went on to form his own party: Mashrou’ Tounes, or the “Tunisia Project”. Marzouk, who formerly served as Nidaa’s secretary general, said he took issue with Hafedh’s sudden rise to power, telling French newspaper Le Monde at the time that there was an attempt to empower a certain individual in the party for no other reason than his name. The schism over the party’s internal structure and appointments was further exacerbated by another key dispute over its political direction. Nidaa Tounes had to make a decisive choice: either enter a coalition government with its rival, Ennahda, which became the largest bloc in parliament following the resignations of dozens of Nidaa Tounes MPs, or form a coalition with opposition forces. The camp supporting the president’s son, mainly made up of the old regime, argued that rejecting an alliance with Ennahda meant alienating a third of voters. On the other hand, the Marzouk-led camp saw the alliance as a betrayal of voters who considered Nidaa Tounes to be a counterweight to Ennahda, weakening the party’s standing as the defender of Tunisia’s secularist tradition. Following lengthy political wrangling, Nidaa Tounes and Ennahda wound up forming a coalition government, with an independent technocrat as prime minister. Nidaa Tounes’ members would grow divided once again, as the compromise prime minister, Habib Essid, was sacked – and young technocrat and Nidaa Tounes member, Chahed, was appointed in August 2016. Chahed fell out of favour once he began making changes to his cabinet in late February 2017, sacking Nidaa Tounes-approved ministers without consulting his party. “We have not put [Chahed] in this position so that he could appoint collaborators that we do not know or that he treat ministers from Nidaa Tounes in such a way,” Hafedh is heard saying in a leaked audio recording of a party meeting in 2017. Chahed would go on to declare a “war on corruption” later that year, targeting wealthy businessmen, including members of his own party. Corruption, still rife in Tunisia, was one of the main catalysts of the uprising. From that point onwards, according to analysts, Chahed understood that he would need Ennahda’s support to survive a confidence vote in parliament, should it come to that. He also obtained the support of Marzouk’s camp in parliament. The two found common cause in their opposition to the president’s son, Hafedh, who in turn began pressuring Ennahda to withdraw its support for the prime minister, which the party consistently resisted. The internal rift culminated in Nidaa Tounes’ suspension of the prime minister’s party membership in mid-September, and Essebsi’s unexpected announcement of the end of his alliance with Ennahda a few days later. “The consensus and relationship between me and Ennahda has ended, after they chose to form another relationship with Youssef Chahed,” Essebsi said in a televised interview. Dihstelhoff said that while Ennahda cannot be held directly accountable for the division within Nidaa Tounes, its decision to support the prime minister has accelerated the latter’s “internal disintegration process”. Ennahda claimed that its support for Chahed stemmed from the belief that an entirely new cabinet would further destabilise the country at a sensitive time. In effect, the 43-year-old technocrat is the seventh head of government in as many years, and his most recent cabinet reshuffle, although partial, is the 10th major government overhaul since 2011. MP Leila Chettaoui, a former member of Nidaa Tounes and supporter of Chahed in parliament, recently told local media the prime minister was finalising the formation of his own party. Speaking in parliament last month, Chahed lamented that his government had been forced to work “under random shelling from friendly fire for the past two years”. The news of Chahed’s new political project, which Nidaa Tounes has taken as a move to “target” the party, would solidify the shift in Tunisia’s political landscape seen in the exodus of Nidaa members from the party. Amidst this internal strife, Ennahda’s backing for Chahed is viewed as tacit support for Chahed’s possible candidacy in the presidential election – due to take place later next year. Riahi’s legal proceeding against Chahed “is part of a political battle between his party and Ennahda,” said political analyst Youssef Cherif in an email interview. “Nidaa Tounes is relying on the state apparatus to counter Ennahda,” he said, in reference to the military judiciary’s involvement with the legal proceedings. Ennahda “tried to bypass” Essebsi, so “he’s now counter attacking,” said Cherif. “Will they find a way out of their disagreement and reconvene? Maybe. But now Essebsi is raising the bar amid a tense climate. That’s dangerous for Tunisia’s stability,” he added. With unemployment hovering above 15 percent and inflation estimated at eight per cent, Tunisia had its largest general strike in five years take place late last month, and unions have warned there is more to come. Tunisia is going through “a difficult phase of political turmoil” that has taken the form of “increasing protests and strikes, caused by the deterioration of the socioeconomic conditions of the largest part of the population,” said political commentator Mohamed-Dhia Hammami. As for stability, Cherif said Nidaa Tounes is “collapsing and it’s been collapsing since 2015”.